Young children who have a pet dog in the home are less likely to go on to develop asthma, a large Swedish study has found. Exposure to a dog in the first year of life was linked to a 13% lower risk of asthma in later childhood among the 650,000 children the authors tracked. The findings, in JAMA Pediatrics, support the idea that pets can bolster the immune system and prevent allergy. More evidence is still needed - past studies have found conflicting results. Certainly, for a child who is already allergic to dogs, buying a puppy would not be a good idea, say the Swedish researchers. Pets are a common cause of allergy, with half of all asthmatic children allergic to cats and 40% allergic to dogs, according to the charity Allergy UK. When animals groom themselves, they lick. Skin cells covered in saliva - animal dander - are shed along with loose fur. It's the dander to which some people become sensitised. The findings of this latest study suggest exposure to dog dander in infancy might actually be beneficial. Children who had grown up with a dog in their home were less likely to have asthma at the age of seven than children without dogs. Living on a farm with lots of animals seemed to confer even more protection, cutting the risk of asthma by about 50%. 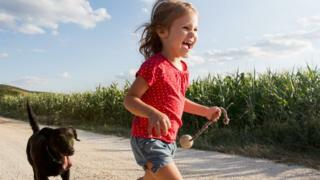 Lead scientist Prof Tove Fall, from Uppsala University in Sweden, said: "Our results confirmed the farming effect and we also saw that children who grew up with dogs had about 15% less asthma than children without dogs." She said this fits with the hygiene hypothesis which favours exposure to dust and dirt to improve our tolerance of common allergens. The findings should also provide some reassurance for parents. "That's important information for parents who are pregnant or are planning to have a baby, that they should not worry about getting a dog or a puppy if they would like to. "But if you have an allergic child you should not get a dog to cure your child. It won't work and will probably make the allergy worse." If you are allergic and live with pets, there are things you can do to cut your risk of having an allergic reaction. Amena Warner of Allergy UK said: "There have been a few studies that have alluded to this but not such a longitudinal study with so many children so from that point of view this is quite a powerful study. It's very welcome." Erika Kennington of Asthma UK, said more research was needed to better understand the effects so that it could be turned into practical advice for parents of young children.